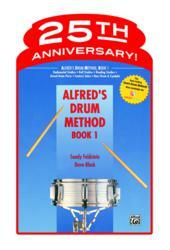 Alfred Music Publishing, the world leader in educational print music publishing since 1922 and home to the world’s largest percussion print music catalog, celebrates the 25Th anniversary of its best-selling Alfred's Drum Method, Book 1, the industry's most comprehensive beginning snare drum method. With more than 500,000 units sold worldwide, the book was created by award-winning arranger/composer, percussionist, and author, Dave Black, and the late educator, conductor, and award-winning arranger/composer, Dr. Sandy Feldstein. Alfred's Drum Method codifies what a book that teaches music should be: clear explanations, coupled with perfectly appropriate exercises that build the best possible foundation for any aspiring drummer. Lauded as the staple drum method book by widely respected music educators and world-renowned musicians, Alfred's Drum Method, Book 1 endures as the ideal teaching tool to help prepare beginning players for all styles of snare drum and percussion performance. The instructional method, featuring the solid pedagogy that paved the way for all drum method authors who followed, focuses on rudimental studies, roll studies, contest solos, and bass drum and cymbal technique, as well as 23 solos suitable for recitals and contests. To view the official Alfred's Drum Method, Book 1 25th Anniversary Video, visit alfred.com/alfredsdrummethod. According to well-respected authors, artists, and music educators, Dave Black and Dr. Sandy Feldstein have earned the credibility of being the industry’s most sought after authorities in percussion method and studies. Alfred's Drum Method, Book 1 (00-138) and Book & DVD set (00-23196) are now available from $9.99 to $19.95 at music retail stores and at alfred.com/drums. The method book is also available digitally at the iBookstore and on SmartMusic. Book 2 is also available, sold separately. Alfred Music Publishing is the world’s largest educational music publisher. Alfred produces educational, reference, pop, and performance materials for teachers, students, professionals, and hobbyists spanning every musical instrument, style, and difficulty level. Alfred’s home office is located in Los Angeles, with domestic offices in Miami and New York, as well as offices around the world including Australia, Germany, Singapore, and the United Kingdom. Since 1922, Alfred Music Publishing has been dedicated to helping people learn, teach, and play music. Alfred currently has over 90,000 active titles. Alfred represents a wide range of well-known publications—from methods like Alfred’s Basic Guitar, Alfred’s Basic Piano Library, Premier Piano Course, Sound Innovations, and Suzuki, to artists like Led Zeppelin, The Rolling Stones, Bruce Springsteen, Van Halen, Green Day, Michael Jackson, Sheryl Crow, Eagles, Cole Porter, and George and Ira Gershwin, to brands like Star Wars, Harry Potter, Lord of the Rings, Rolling Stone Magazine, and Billboard.